This tutorial displays better if you have the Candara font available (so, from a browser on Windows or after installing this font on Linux.) The Candara font and my use of the Ergonomic Keyboard 4000 are practically my only concessions to Microsoft's product line. These notes are intended for an Ubuntu 18.04.1 Bionic headless server installation (and I have done this), but the day I wrote this, I did it from scratch using a spare desktop. I began an ELK installation on host tuonela (at home). Note that commands that require root access are simply prefixed with # instead of $. As I'm acquiring the relevant packages, there is no possibility of automatic update. You need to install Java 8 or later and set up JAVA_HOME. If you install something newer than Java 9, some Elastic 6.4.2 agents will complain of an unrecognized VM option (UseParNewGC). This option disappeared in Java 9 and you may safely ignore this error. You may also safely ignore error, "chmod: cannot access '/etc/default/logstash': No such file or directory' if you see it. These notes assume you're running Ubuntu Server 18.04.1 Bionic (headless). If something else, your mileage may vary. For example, earlier versions of Ubuntu, that is, prior to Ubuntu 15 Vivid, did not offer systemd, so the systemctl commands below will have to be done otherwise (at very least you can pop open a shell and run them from the command line). Elasticsearch is a service that runs as user elasticsearch (used to be user elastic.) Once installed, you need to change the password (using root) to changeme for this tutorial. Nginx light. Not strictly a member of the ELK stack, this is to host Kibana. It's difficult to find package downloads, but if you can, these are the ones that will give you the lightest footprint. Or, you can just install the canonical (lowercase—no pun intended) package (see apt-get command just below). Created symlink /etc/systemd/system/logstash → /lib/systemd/system/logstash.service. Information in /etc/filebeat/filebeat.yml would lead you to believe that Elasticsearch's user/password is elastic/changeme, but the user is now elasticsearch and you should have changed the password to changeme for this tutorial. Aug 25 09:27:56 tuonela systemd: Stopped Elasticsearch. Aug 25 09:27:56 tuonela systemd: Started Elasticsearch. ** Yes, I changed Elasticsearch's password to changeme for now. This version does not support systemd services. I must run Filebeat from the command line. In a browser, for Elasticsearch, I see the same thing as from curl. Note that if I make my browser address line http://tuonela, I just get Nginx' welcome message, which is exactly what I'd expect. In early experimentation and testing, it might be useful to know how to drain ELK without having to obliterate the installation and start over from scratch. This amounts to draining data out of Elasticsearch. There are a couple of ways, the right one is to use the curl command below, but I'm giving other details too. 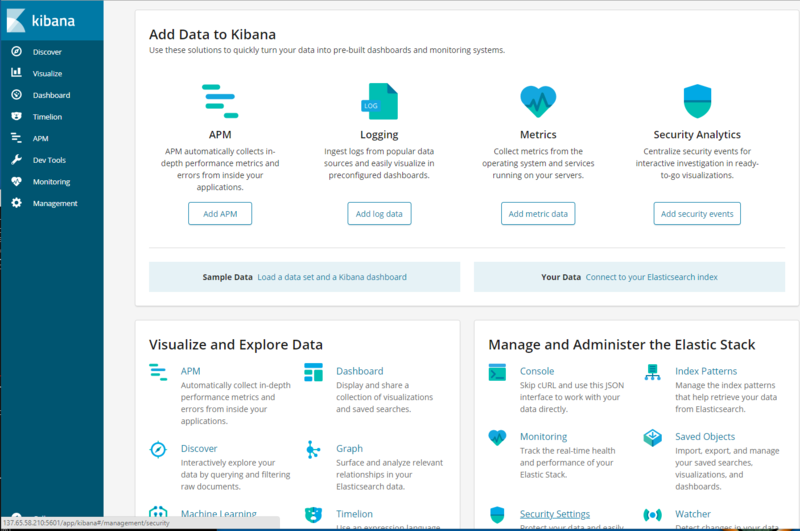 A common security precaution is to allow access to Elasticsearch from only localhost and to restrict access to Kibana by using Nginx as a reverse proxy to Kibana running on localhost. Use either HTTP authentication to restrict access to Kibana or use LDAP authentication from Nginx. Kibana since 6.2 has something called application performance monitoring (APM); it's a module that's loaded. See APM with Elasticsearch, Elastic Stack (ELK Stack).